Ernest Angelo Bato didn't think that a dab of chili sauce on his pizza back in grade school was a sign of things to come. It was his first memory of actually enjoying piquant flavor in food, and fast forward to today, Gelo is flourishing as a chili merchant and the owner of chili-based produce brand Hanghanghang. The decision to put up this kind of business two years ago, despite failing at previous engagements and having a handful of debt was an easy one to make since he himself "consumed a lot of chili." "The concept came about when I hit rock bottom, and I stumbled upon an article online about a self-made millionaire in his mid-20s," he shares. "Then there was one line that struck me: 'Instead of being a consumer, be a producer.' It was a lightbulb moment, which I took action on right away." From making sure that there was a jar of chili on the table every meal time, Gelo is now sharing his love for chili by stuffing as much heat in every bottle of his product. Hanghanghang offers three main products through its official Facebook page: Chili Mayo Sriranch (good for tacos, nachos, chicken lollipops, and salad), Chili Garlic Sauce (all-around, not just for siomai), and Chili Cajun Salsa (chicken wings, pizza, and burgers). 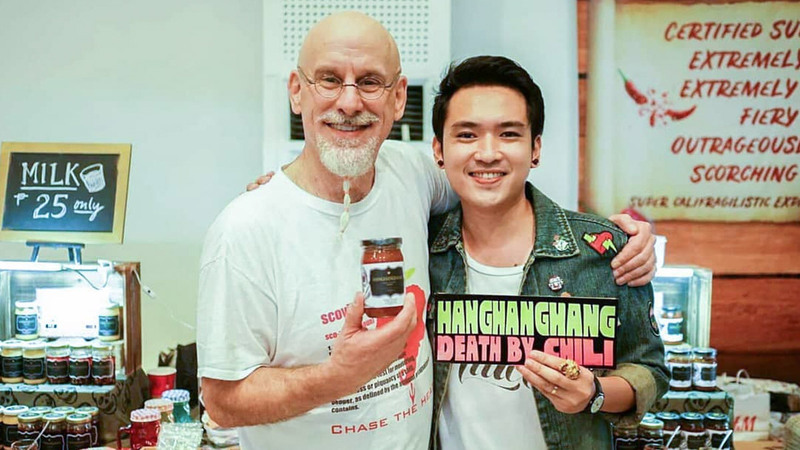 More than the dozens of bottles sold every week (sometimes, even daily), a testament to Hanghanghang's early success was the priceless recognition they received from the Philippine Chilli Festival-Hot Sauce Competition last year. Just a year in the market, and the Chili Mayo Sriranch had already bagged first runner-up in the Dips and Spreads Category, while the Chili Cajun Salsa won second runner-up in the Salsa Category. According to its online description, Hanghanghang is "an artisanal run of spicy goods rooted on its trade," staying true to their slogan "Death by Chili." For a company that carries a rather dark tagline, Gelo's passion for his product burns bright, and more appropriately, hot. When Johnny Scoville recently visited the country for the 2018 Chili Festival, Gelo couldn't help but fanboy over the man behind the popular chili-themed YouTube channel Chase The Heat (25,443 subscribers). To think that a few years ago, he had no idea who Johnny Scoville was. For him, "You should be the product of your own product. Word of mouth is key, so you have to have the heart for anything spicy to keep the word going." How would you describe the market for chili-based products in the Philippines? To be honest, we only have a niche for chili-based produce since the Pinoy palate is not that into spicy as compared to other countries, like Thailand, India, and Korea, where spice is a staple. But Filipinos are known to be foodies and are really driven by challenge, which is why introducing chili sauces and superhots to the Philippine market was easy. The SamYang Spicy Noodles challenge was actually one of the game-changers, which brought about growth in the number of enthusiasts for anything spicy. To add, we now have a group for chiliheads—the Philippine Hot Sauce Club, with four thousand strong members, and growing. What sets your brand apart from the competition? Competition is everywhere and has long been there. But I'd like to quote Joyce Pring on this: "Be so good, that people can't ignore you." That one-liner from a marketing seminar I attended way back in 2016 became one of my cores in doing the sauce business. So I really work hard (and I am so OC) in every area—from the sauce recipe itself, the logo and branding, the labels, to the social media content. I didn't want to be just another sauce on the shelf. The whole Hanghanghang experience is my proposition. Is the local chili sauce community more cooperative or cutthroat? How is your relationship with your fellow sellers? Now that's where the interesting part comes in. Having the Philippine Hot Sauce Club in the picture, it's not about the competition this time. We now have this community of different hot sauce makers, sellers, and enthusiasts, working together to uplift the hot sauce scene and the chili community as a whole. Why? Once we have a strong following and community base, aside from making noise, we can actually seek for funding and sponsorships from government agencies and other sectors and create programs for our chili farmers and small and medium-sized enterprises. "If one doesn't have the heart for chilies, it can easily make a person give up"
What have you learned about chili as a product? I've learned that chili is no joke. Processing chilies are no joke. Growing chili is no joke (since I've been trying to grow chilies in our backyard for two years now, and no luck). Cooking chilies are no joke. So if one doesn't have the heart for chilies, it can easily make a person give up. Any new discovery that you think a spicy food lover should know? Nothing much of a revelation, but I think it is very important—that chilies are very rich in Vitamin C. Chilies contain up to seven times the Vitamin C of an orange. So more reasons to munch on them. Can you briefly explain the chili sauce-making process? What is the most meticulous part of the entire preparation? Well, you have to wash them first thoroughly. Next would be de-stemming (which for me I think is the very meticulous part) each and every piece of chili. Side story, I remember when I got my first bulk order, that I had to de-stem 10 kilos of chilies all by myself. Then processing the chilies would differ depending on the output—be it the coarse chili-garlic sauce, or the thick chili paste, or the fermented hot sauce. Do you think the current trend of selling bottled chili products is just a fad? Or is it something that can grow into an even bigger industry? As I've said earlier, the chili-based produce has only a niche in the local market. Good thing we Pinoys are competitive, and thanks to spicy challenges, which started out as a fad, it grew into something else—a community, and later on, who knows, an industry. What struggles did you face, especially when you were just starting out? What was the lowest point in your life as a chili merchant? The typical family rejection. They weren't directly rejecting the idea, but you can sense it from their comments, like, "Kawawa naman yung anak ko nagtatangkay lang ng sili," or "Sayang naman yung tinapos mong kurso." But I know what I wanted to do, so I just pressed on. Looking back, I don't think I have any lowest point in my chili merchant life. I believed in the idea wholeheartedly, so I worked hard on it day and night. Rejections and setbacks were nothing. I always think, "Lahat naman mahirap, wala namang madali." How are you affected by the skyrocketing chili prices? What are the sellers doing to address this current dilemma? Most of us are really affected by the sudden price increase of chilies. Fortunately, since we have the Philippine Hot Sauce Club as a community of makers and sellers, we collaborate and collectively purchase in bulk from the growers, so we can at least bargain for a little lower price. At the same time, we cannot underbid the farmers because of their hardships just to yield produce, especially during these times of typhoons. How would you compare Hanghanghang to your other businesses? Before I started Hanghanghang, I was engaged in a network marketing business for almost five years. Sadly, things didn't work out. But being in that industry was actually a turning point. I have been exposed to so many things and learned plenty of lessons. When I put up Hanghanghang, I somehow knew different factors as to why it will and will not work. For one, you should have a unique consumable product. This will enable you to generate repeat sales, which was an issue when I was in the clothing line of business. Once people have bought shirts, give it a month or two before they buy again, unless you come up with new designs or trends in a snap. What are the pros and cons of being self-employed? Sure money isn't as stable as compared to having a day job. But that's where the excitement of being creative comes in. Being self-employed allows you to work on your own pace and be as innovative as possible to generate cash flow. It puts your brain to work. And the most exciting of all is the truth that in a world of uncertainty, anything is possible. Who knows, one day, you might get that multi-million phone call. Can you share your most important entrepreneurial lesson? What advice would you give to aspiring chili businessmen? When you hit rock-bottom, there's no other way to go but up. There's this fellow chili sauce maker brother to whom I always say, "Just keep swimming."